This beautiful **ONE OWNER** 2006 Honda CR-V 4x4 drive so nice! With ample power, room and refinement, the 2006 Honda CR-V has all you need in a mini SUV. In the all-important areas of drivability and practicality, the Honda CR-V is hard to beat. One of the major advantages most mini SUVs have over their larger midsize counterparts is superior handling, and Honda is at the top of the heap. This CR-V comes fully equipped with power windows & doors. AWD. AM/FM/6-CD Radio. ICE COLD A/C. Steering wheel mounted controls. Sunroof, And so much cargo space! This car handles beautifully and looks great! Come by and check it out for yourself! You won't be disappointed! 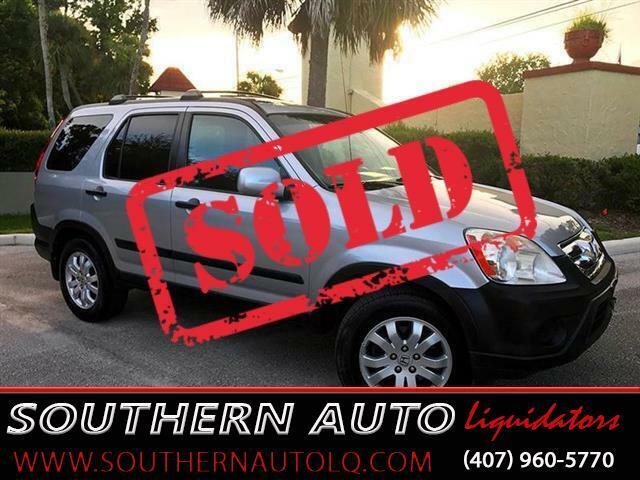 Get a well-maintained, competitively-priced, Used Car in Winter Springs at Southern Auto Liquidators. We hand select our Used Vehicle Inventory, to offer unsurpassed quality and value. GIVE US A CALL TODAY FOR YOUR PERSONAL APPOINTMENT... 407-960-5770. ***You will never pay dealer fees at Southern Auto Liquidators. *** We believe in giving you the highest quality vehicle for the lowest possible price. Give us a call or text, and we will be happy to calculate your total out-the-door cost. We Accept VISA, MasterCard, CASH, Debit Card . NEED FINANCING, WE CAN HELP, FINANCING IS AVAILABLE... GREAT RATES!!! We can also work with your bank or credit union, please visit your bank or credit union for financing information if you prefer to go through them.